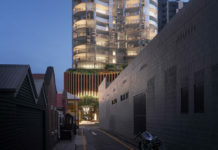 JGL Properties, the developer behind Newstead Series has submitted a development application for a new 18 storey residential apartment building located at 11 Thornton Street, Kangaroo Point. The proposal consists of 16 full floor residential apartments, as well as one 3 bedroom apartment as part of a restoration of a heritage building on site. Once used as a residence for the Queensland Water Police, the home is believed to be built around the early 1900’s. A 76 square metre cafe is proposed in a space underneath the heritage home which aims to create better park and street activation. The project has been designed by Bureau Proberts and includes a full floor recreation deck with pool, lounge area and gym. The proposed development will join the existing 1 Scott St apartments and the future residential tower ‘Walan’, 2 Scott St, to create a ‘trilogy’ of high end multi-residential buildings for Kangaroo Point. According to the development application, the tower aims to add to the skyline of Kangaroo Point while remaining in scale with the Scott St and Dockside apartments (Stradbroke and Macleay Towers). The DA number for this development is A004480738.